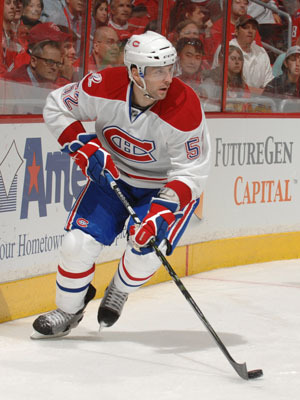 MONTREAL -- There was only one place Mathieu Darche wanted to spend the 2011-12 season: Montreal. Having gone on a North American tour, playing for 10 different teams from 2000 to 2009 before finding a home with the Canadiens, the 34-year-old forward didn’t keep anything hidden about his desire to don a Habs jersey for another season with the team. Negotiations for Darche’s new contract with the Habs were completed quickly and without much hassle. After inking his first one-way contract with the Canadiens last year, the Habs’ No.52 made the most of his 2010-11 season, enjoying a year of personal highs, posting 12 goals and 26 points in 59 games. While he might have been looking for a two-year deal this time around, Darche is still very satisfied with his latest contract. With a May 18th abdominal surgery now in his rear-view mirror, Darche is currently in the middle of his rehabilitation program. Already looking ahead, the veteran predicts good things are in store for his team’s upcoming campaign.